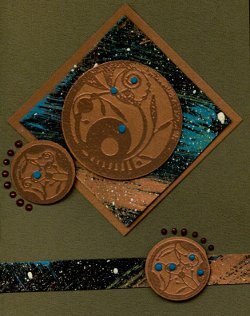 These cards were made at the Club Scrap retreat in August 2010. Michael Strong taught this class and these were his designs. For the card bases, we used 3 colors of card stock, Olive, Teal and Lime. 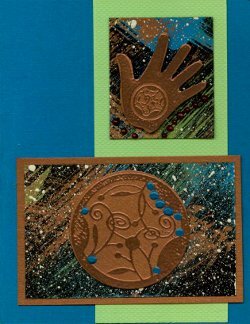 The Metallic Copper paper and Embossing Powers as well as the Hand and Circle Stamps were Michael's. 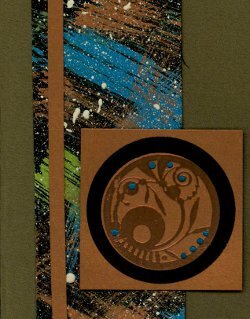 Once the Black and painted Background paper was dry, it was cut into strips, squares and rectangles and added to both the outside and inside of the cards. I am adding these to the Michael Strong Readers Gallery as they are stunning - even though I made them myself - I had his help and instruction to do so. Join in and write your own page! It's easy to do. How? Simply click here to return to Readers Mike Strong Gallery. 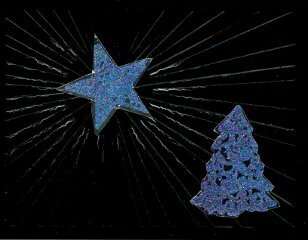 For these Christmas Cards, I used an Embossing Folder called Sun Rays on a black glossy cardstock. It actually broke the black surface of the cardstock and makes the white core show through. Pretty cool for Star Rays. 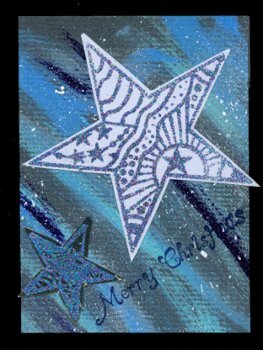 I used the Michael Strong Cloisonne Tree and Stars for these cards. 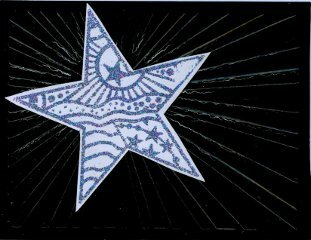 I embossed stars and trees on White using a Peacock Embossing Powder and glued the stars over the center of the Sun Rays pattern. 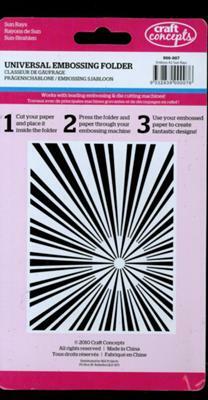 In case you can't see the Rays in these photos, here is the picture of the Craft Concepts Universal Embossing Folder called Sun Rays. 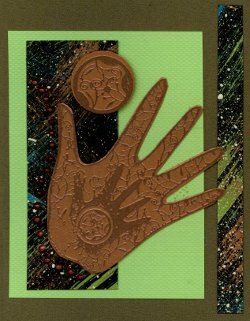 As the previous poster did, I painted the background paper to use as card fronts and then cut out my embossed stamp images and attached to the card fronts. 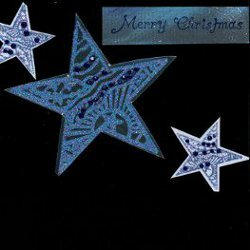 Even the greeting "Merry Christmas" was from Michael Strong's Catalog called Words & Phrases. 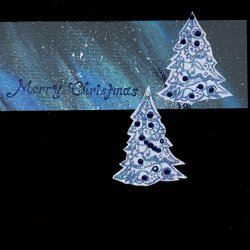 I also used the black glossy cardstock from Club Scrap and the Pearl Pens in Silver and Dark Blue. I did three full 12 x 12 sheets of the background painted design, but I was surprised at how far it went. I got 10 cards made from one 12 x 12 with 6 completely covered and 4 with only a piece of the background. 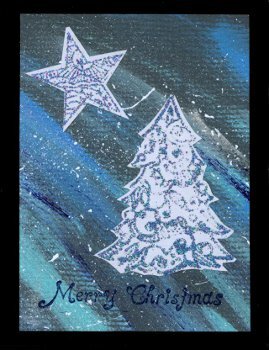 I used Michael Strong Cloisonne Stamps Christmas Trees and Stars.